When G2 Crowd told us that we’ve been recognized as a Leader in the Lead Capture Software category, we were like, “Aww, shucks!” and, “That’s awesome!” because this recognition is from real, verified user reviews. This means that our clients love us, and you know what – we love them right back. If you’re not familiar with G2 Crowd, it is the world’s leading business solutions review website. Professionals rate and research solutions to help each other make informed decisions on products for their businesses – using each other’s feedback, it helps make it a little easier to trust vendors and try new tech. For NetLine, we’ve received the Leader rating on the Spring 2018 Grid and Index reports by receiving positive reviews in the Lead Capture category. This recognition follows the release of recent enhancements to the NetLine Portal, which have been the product of digesting client feedback and using it to constantly innovate. Our clients range from enterprise marketers, publishers and agencies, to self-service marketers who leverage our vast content syndication network to drive lead generation. 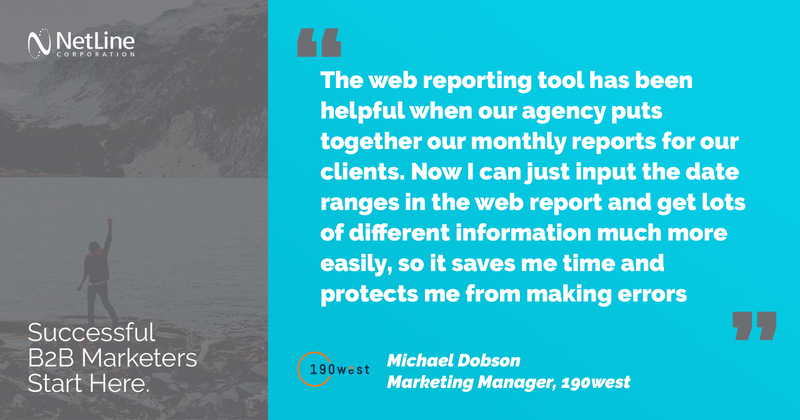 With their input and the talent of engineers behind the scenes, we’ve rolled out a number of enhancements including, but not limited to, real-time campaign analytics on the NetLine Portal, which some reviewers comment as being super helpful in making them look good for their clients. Aside from the street-cred boost to users, the functional benefits help render real-time data in a visually appealing way. Interactive charts and pivots (pivots for days) allow marketers to manipulate data sets and extract the metrics they need to optimize campaigns. In the last 12 months, we also rolled out a major advancement in our predictive lead generation form technology. These updates reduce the number of fields that a user is required to complete, all while capturing an 18-point professional profile for each individual lead. This cuts required data entry by 60%, lowers abandonment rates, and users have a much better experience! Less typing = good. 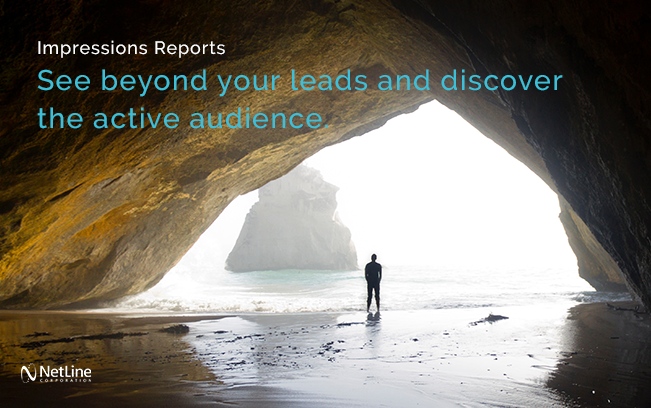 Another area of the Portal that has been developed with feedback from clients are the Impressions reports – essentially, we’re applying the Allegory of the Cave to content syndication and allowing marketers to see what exists beyond the lead profiles of their campaigns. By discovering activity from all who consume content, marketers can better understand where their content resonates most, and tweak their approach to content development or content deployment. The information from Impressions – while it’s not advising you to do any particular *thing* to your approach it’s saying, “Hey, there are some people over here with demand for your content.” This might rock the boat a little bit; marketers may be comfy with their tidily packaged personas – who are being confidently catered to, with carefully curated content (all the alliterations). Once established, it’s easy to get locked into a myopic content strategy. Visibility into impressions in tandem with your total content download data (good and rejected leads) helps shed light on preconceived notions behind consumption behavior that may disrupt a marketer’s perception of the ideal lead profile. But, we digress – vis-à-vis these recent updates, it’s clear that we take feedback to heart. Our favorite part about this recognition from G2 Crowd is that it’s derived from real marketers who share our vision to democratize lead generation. 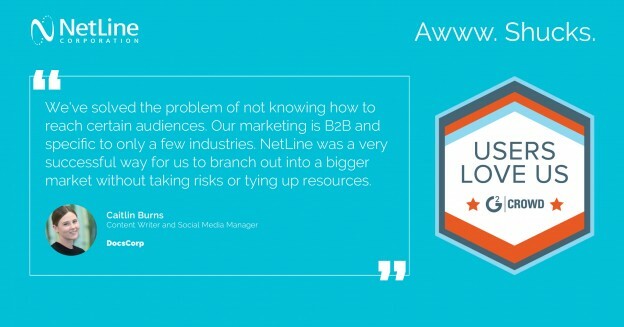 The NetLine Portal takes this concept of “quality leads for all”, and wraps it up in a tool that weaponizes lead generation strategies for marketers on any scale. It’s tough out there for content – our network allows hyper-targeting and pay-per-lead structure that can give content a voice at a pace and price that makes sense for all. At the end of the day, helping marketers on all sides of the industry is rewarding. Delivering in-market leads across so many industries takes agility and innovation, but it’s only possible with clients who believe in what we’re doing and want others to succeed. Thank you to all of our clients and to G2 Crowd for this recognition, and for inspiring a rather philosophical blog post. Posted by Elizabeth Johnston on April 26, 2018 .